Pacific Princess returned to service today after a two-week, multi-million-dollar dry dock that gave the ship a new look inside and out. The complete story appeared in the June 9 edition of Cruise News Daily. Symphony of the Seas Floats! STX France floated out Symphony of the Seas today at their Saint-Nazaire yard. Details appeared in the June 9 edition of Cruise News Daily. Are you planning to sail to Cuba? Maybe, or maybe not. The Miami Herald reports that President Trump will reveal his Cuba policy next Friday in Miami. It seems the Australian market just keeps growing, and Carnival Cruise Line is just about to open their 2018-2019 Australian program for sale, expanded with the two ships offering more than 70 sailings during the Austral summer season. A long-term agreement between Royal Caribbean Cruises Ltd (RCCL) and Broward County (a/k/a Port Everglades) has prompted the port to invest more than $100 million in a complete makeover of Cruise Terminal 25. Playa del Carmen is considering building a pier to accommodate cruise ships, but financing is a problem. Southampton had its busiest cruise ship weekend ever last weekend. It's not just cruise ships. The US Navy reported a man overboard Tuesday afternoon 80 nauticle miles off the North Carolina Coast. What Have They Done to Legend of the Seas? The former Legend of the Seas has been sailing for a couple of weeks in her new identity for Thomson as TUI Discovery 2. A couple weeks ago we shared a video with you about the painting of the hull. That was the exterior of the ship. But inside, interior refit specialists Trimline were given the task of rebranding it, and making it look like a Thomson ship, not Legend of the Seas. One of the major projects was the combination of two spaces into one of the main entertainment areas, the Live Room, shown below. The folks in Abu Dhabi saw something yesterday that they aren't used to seeing: a cruise ship calling during the summer months. Majestic Princess visited the port as part of its repositioning cruise from the Med to China where it will next be homeported. Details appeared in the June 6 edition of Cruise News Daily. 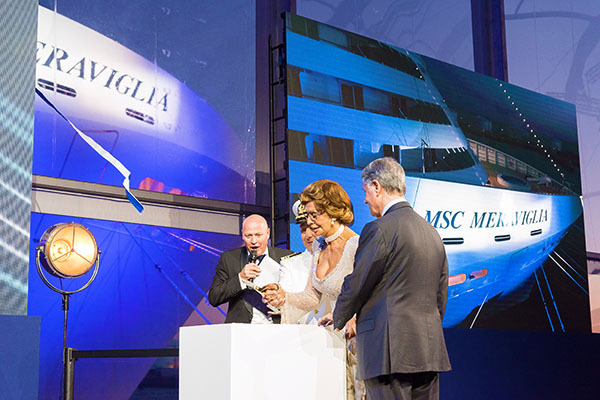 If you happened to open Facebook on Saturday afternoon (in the US) and happened to go to MSC's page, you had the opportunity to attend the christening of MSC's new flagship, MSC Meraviglia. It was a very French affair. It was a formal affair, set in one of France's most historic ports (Le Havre), to watch a great ship christened, built in one of the great French shipyards with a history for building iconic vessels. And it was about to be christened by an iconic Italian godmother (and film legend) - but she was speaking French. Photo courtesy of MSC Cruises. All rights reserved. May not be copied or used without express permission.